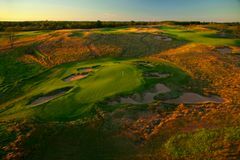 While Whistling Straits is certainly the marquee name when it comes to golf in Wisconsin, Erin Hills has quickly developed a strong reputation as a top class golf course since its opening in 2006. Golfers embarking on USA golf holidays will love this naturally formed golf course that, like Whistling Straits, bears a striking resemblance to the classic links courses found in the UK and Ireland. Since its inception in 2006 Erin Hills has garnered considerable praise and the quality of the design has been highlighted by the fact that, in its relatively short existence, the 2008 USGA Women's Amateur Public Links Championship and the 2011 USGA Men's Amateur Championship have both been played at Erin Hills. The U.S. Open Championship will also be held here in 2017 so it is clear that Erin Hills is a top class golf course, ready to challenge even the finest players in the world. While Erin Hills measures over 7,800 yards from the tips, it is also accessible golfers of all different shapes and sizes thanks to five separate tee positions. Immaculate, naturally undulating fairways wind their way through seas of punishing fescue grasses placing a great emphasis on accuracy and course management rather than simply brute strength and ignorance. Signature oaks, maples, tamaracks and hickories also accent the course without inhibiting play or obstructing the stunning vistas. All elements of this course combine to offer travelling golfers a challenging and infinitely enjoyable test of golf that appeal to modern golfers and traditionalists alike.